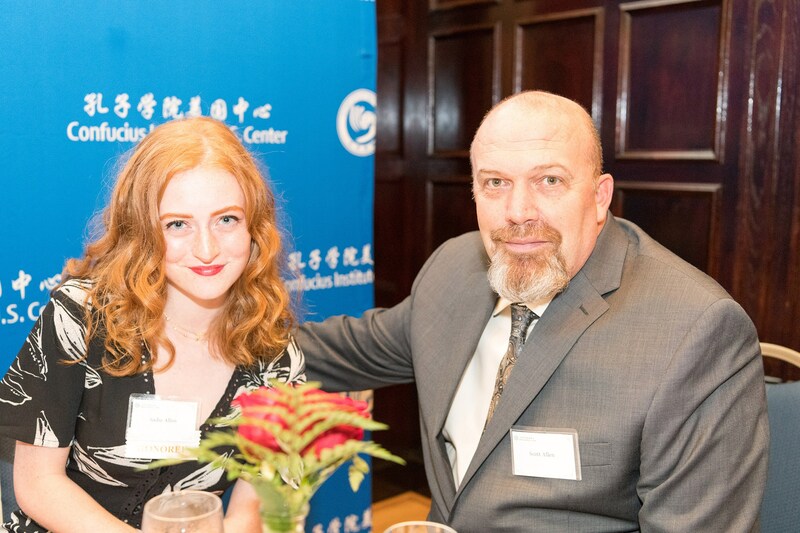 Polk County High School senior Sadie Allen received an award at the Confucius Institute 2018 National Honors Gala, held Sept. 15 in Washington, D.C. The Confucius Institute U.S. (CIUS) Center’s third annual National Honors Gala at the National Press Club recognized the accomplishments of 10 exemplary Confucius Institute students selected from universities and school systems across the country. More than 220 guests including distinguished business leaders, educators, public officials, diplomats, media representatives and artists joined in celebrating the value of global education and the importance of people-to-people exchanges between China and the United States. Allen and her fellow People-to-People award winners were selected based on their personal stories and active engagement with Chinese language development, cultural awareness and global education programs. Many of them received commendation letters from their Congressional representative. Allen recently completed her sixth year of studying the Chinese language and culture at a Polk County Confucius classroom in partnership with the Confucius Institute at North Carolina State University. She hopes to major in Journalism or International Relations and minor in Chinese language after her graduation from PCHS. 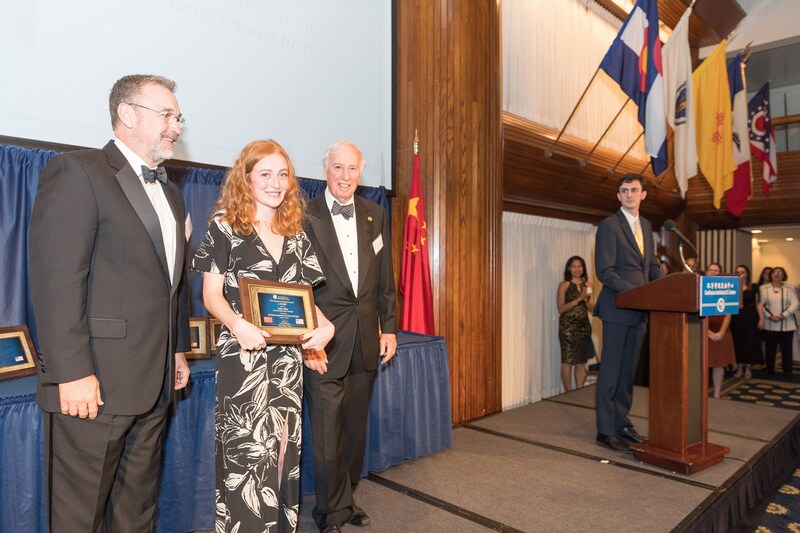 Polk County High School senior Sadie Allen is presented her award at the Confucius Institute 2018 National Honors Gala in Washington, D.C. (photo courtesy Confucius Institute U.S. Center). Walking into middle school on my first day, nervous and clad in a horrifyingly sparkled sweater, I entered a classroom filled with students who were just as anxious as me. This was not any regular class that focused on algebra or history. This was my first-ever Chinese class: my gateway to the world. Little did I know that this one class would spark an intellectual odyssey that has accompanied me to eleventh grade, where I am now finishing my final high school language course in a Confucius Classroom. From my humble beginnings simply learning about the vast culture of the country, to delving deep into the language, Chinese has left a remarkable impact on my learning and my life, one character at a time. Perhaps the most influential piece in my journey was my Chinese teacher, Lou Laoshi. She began teaching me in my freshman year of high school, yet another nervous start in my educational endeavors. While I was anxious about taking such a difficult language, Lou Laoshi made it approachable. I recall grumbling about her strict policies: we were only to speak Chinese in the classroom, and we were to memorize characters religiously. These practices soon bloomed into a wonderful foundation, allowing me to climb my way up to the top of my class. I even began speaking Chinese to my family, much to their dismay. I still accidentally thank waiters in the language! Even though I didn’t realize it, I was immersing myself in Chinese, inside and outside of the classroom. I began to drink Chinese tea and research Chinese ways of life, which helped me navigate my own struggles throughout high school. We even had the chance to put on a play in Chinese for the entire school, entitled “Butterfly Lovers.” I have never been very outgoing, but this play created the perfect opportunity for me to get out of my cocoon. We spent weeks practicing the lines in Chinese, giving me the chance to learn even more words and phrases while using them to talk with my classmates. Lou Laoshi pushed me to practice the language and pushed me to be confident on stage. It worked! Despite my racked nerves, the play was a success. Not only did it advance my language learning, it also brought me out of my shell and allowed me to share my passion for Chinese with the whole school. Without Lou Laoshi pushing me and my classmates to succeed, this dream for my class would never have blossomed into reality. Another unintended (and quite positive) consequence of my fervent learning of Chinese was my widened worldview. Often, China gets stereotyped. The country has 55 ethnic minority groups, each with different ways of life. By memorizing the characters and immersing myself in the language, I found myself understanding the country – and its people – on a much deeper level. We had two Chinese New Year performances during which we invited our friends, family, and the community to eat dishes and watch us dance and sing in Chinese. I was a host at both. I introduced all the acts and explained the holiday and its traditions to the audience — all in Chinese. My first year, I recall relying on my paper and pinyin to host and perform. When I participated this year, I found myself relying more on my own knowledge and skills than the translation sheet. Afterwards, many members from the community approached me to compliment me on how professional my Chinese sounded. It made me immensely grateful for all the hard work Lou Laoshi put into teaching me and pushing me to be better. Without her constant effort to better my language skills, I would not be able to succeed. Now I have dreams of venturing to China and exploring both its history and modern developments. I am even considering studying abroad in a big city there, thus furthering my immersion and allowing me to fine-tune my language skills. This dream was nourished by my teacher as well. Without her dedication to our education and support through the Confucius Institute program, I would not be as well-rounded a language speaker or as resolved in my pursuits. In addition, Lou Laoshi funded our HSK testing with the help of the Confucius Institute. Now that I have passed HSK 3 and will soon take the HSKK exams, I will have the chance to win a scholarship to fund my studies abroad. I hope that with hard work and dedication I can soon make this dream a reality as I embark on my college journey. Chinese, with all its complications and variations, is a language that I will never forget. My experience learning Chinese has been immensely satisfying and life-changing. Many of my memories are tied to it – the class, the tones, even the characters. One of the first striking things that I remember learning about Chinese was that the character for home and family were the same: 家 (pronounced jiā). That is exactly what I found in the Chinese language; not only a family with my fellow students, but also a second home. Though the language’s birthplace is halfway across the globe, it will always have a piece of my North Carolina heart. Sadie Allen, left, with Scott Allen (photo courtesy Confucius Institute U.S. Center).